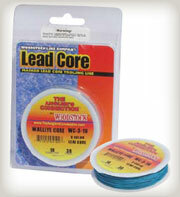 The Perfect Item For The Segmented Lead Core Angler. Walleye core is 1, 2, 3 or 4 individual segments of lead core line. Each segment equals ten yards of lead core. Anglers can chose between 1 segment for shallow trolling presentations, up to 4 segments for deeper trolling presentations. This system allows the angler the flexibility to run multiple baits at different depth at the same time. Walleye core works great with mast style and in-line planer boards.